When your big wedding day is just about entering the planning phase, you of course have a huge amount of work to do. Right? Several things can simply go off-track in the mix up, including your attention to detail and demands for quality. Besides the gorgeous wedding dress that you have envisaged for your wedding, a key feature about which you have to very specific is obviously is the custom made wedding invitations that look both sophisticated and non-traditional. Make a sensation among the invitees by sending your invitations in a style which is different from the traditional way. Like, in case you're planning to host the wedding on a beach, choose to send the invitation placed elegantly in a colored, beach themed bottle. That will make up an impressive invitation that the recipient will treat like a souvenir piece. 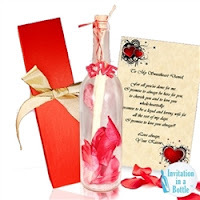 The good thing about these message in a bottle invitations is that, these are very economical. So, if you want to send elegant wedding invitations on a limited budget, the bottle invitations will be just the ones that you need. On top of that these invitations will generate massive excitement among the guests about your wedding event. Today the simple card with the message printed on one side have lost popularity. The modern invitations come in creative formats and multiple folds. The accordion fold layouts are in vogue these days because they look both elegant and different from the traditional. Really stylish wedding invitations they use the origami style which is very popular and in trend today. Besides, the card envelope have origami like folds with a handmade ribbon bow to give it a touch of sophistication. Appropriate wording for the invitations is another key point to note. When you are creating unique styled invitations the wording you choose should be done with complete attention to the details. The words that you use have to reflect the true nature of the event. If the invitation is being sent to a couple, the message should have the complete names of both. If kids are also included their names should go into the invitation message as well. In the event that you are facing difficulty with choice of wording, you can simply explore the internet for ideas. There are some very genuine wedding stationery and invitations websites that offer samples and layouts for making perfect, custom designed elegant wedding invitations cards. You can check out the various designs and the themes displayed on these dedicated websites and decide thereon. The samples will no doubt give you ideas about how you can create great invitations, but remember one thing that you also have to use your creativity.